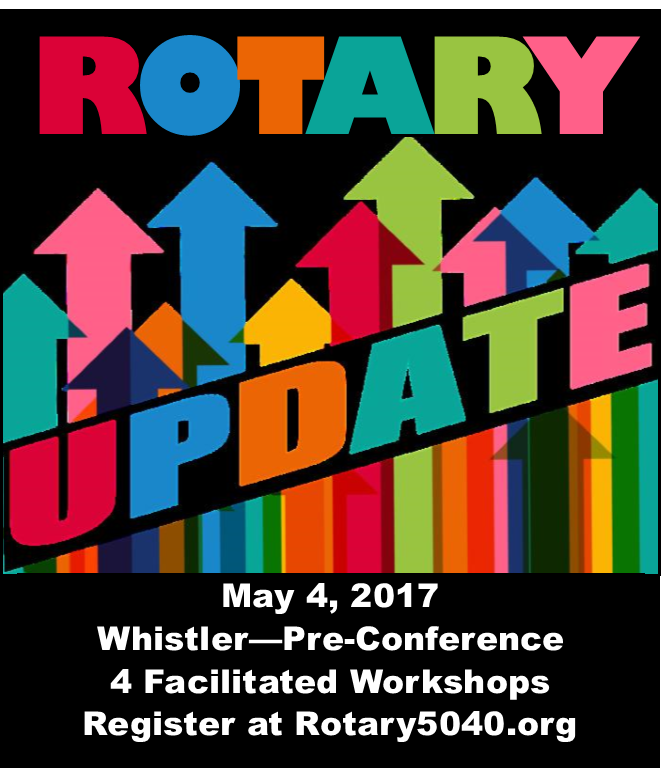 Start your conference early with interactive workshops full of ideas and strategies to enhance the Rotary experience on Thursday May 4th in Whistler at the “Ski Cabin” at 2028 Rob Boyd Way. Membership Mysteries: work together on the challenge of lack of club membership growth, solve the puzzle and leave with ideas and tools to engage and attract members. Reputation and Club Communications: explore with others the essence and value of a strong brand and what clubs are doing to build the Rotary brand through Public Relations strategies and tools. Rotary Uncovered - What Have I Joined? : join other Rotarians to learn what it takes to make Rotary relevant in today’s world and how you can contribute through service to your club and the world beyond. Corralling ClubRunner: explore ClubRunner’s administrative facilities to make them work for your club, such as membership information, reports, mail service, club invoices, club directory, documents. Bulletins, RI website integration and attendance reporting.